!! OMG, from the people who brought you Gotham City: Sarah Palin endorses Trump !! Marvel Comics could not have thought up a clownier couple than these two soiled diapers! 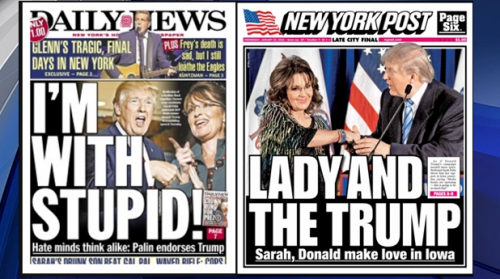 Above are the two different news tabloid headlines in New York regarding the Palin/Trump “lovefest”. I can’t wait to watch this hot mess unfold! Be the first to comment on "OMG, from the people who brought you Gotham City: Sarah Palin endorses Trump"